We've waited all year for tonight. No other awards span the entire globe. The World's 50 Best Restaurants list is unique. Rene Redzepi of Noma shared with the audience that this time four years ago he served fourteen covers in his Copenhagen restaurant all day. He now has over 1000 people on the waiting list. Every day. This is the power of the World's 50 Best list. Ultimately, food will always be about opinion. I'm not a huge fan of salmon. You may love it. I really like a bit of theatre with my meal. You may hate that. Just as explained before the ceremony started, it is subjective. This is not a criticism. Our opinions matter! Let's hope food never comes down to purely numbers. The World's 50 Best list claims to promote and celebrate brilliant restaurants and great chefs. The amount of chefs in the room from top restaurants was a testament to the credibility of the awards. Forty seven out of the top 100 were in attendance. Positions are determined by 800 experts from 27 regions, who review their dining experiences over an eighteen month period. It's democratic if nothing else. No secret handshakes (that we know of). Now in their tenth year, the awards were broadcast from London's Guildhall. The Fine Dining Lovers website kindly had a live stream to the ceremony, meaning us mere mortals were able to watch in real time. In our slippers. Some went as far as pyjamas. Really. I was absolutely thrilled to see Frantzen/Lindeberg (last year's One to Watch) jump from 57 to 20. We went in March and knew instantly that it would be a contender (see review). Dinner by Heston Blumenthal was an interesting new entry at number 9, four places ahead of the three star Fat Duck. Is that even possible? The Fat Duck is a British institution! They boast some of the best theatrical performances I have ever experienced, and I've seen Phantom (I'm joking...) However, saying that although the atmosphere is somewhat relaxed at Dinner, the food is fantastic. Is it really in the same league as the Fat Duck though? That pineapple tipsy cake and meat fruit have gone down in legend in our little society... I haven't quite made up my mind there on whether that's actually mental. Other individual awards on the night included Elena Arzac (Arzac) picking up the World's Best Female Chef and Thomas Keller (French Laundry and Per Se) collecting a Lifetime Achievement award. What appears to separate those in the top spots from the rest is the ability to channel their creativity into something different; sometimes every night. At Noma there is no formulaic performance. It depends what has been foraged and indeed what they have dreamt up. We were lucky enough to visit Noma in March last year, and have a trip to El Cellar de Can Roca booked, so it will be interesting to see how the two differ in terms of dining experience. The Horwich Fine Dining Society go forth... Next on our hit list? D.O.M...? Every so often, a book is released that gives me butterflies when I read it. I knew it would be amazing. Peggy has a baby pink shop. We were always going to get on. 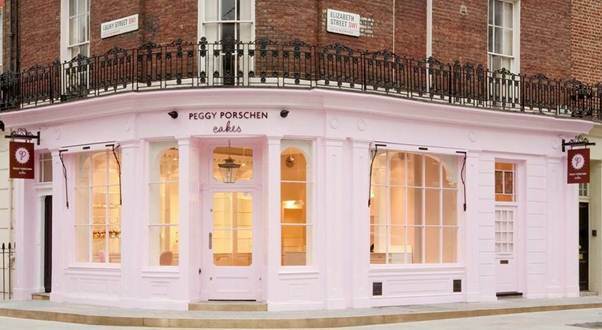 Peggy Porschen moved to England from Germany in 1998 to study at the famous Le Cordon Bleu cookery school. In 2003, she opened her boutique bakery, Peggy Porschen in Belgravia, London. She boasts a wealth of 'A Listers' as customers, including Kate Moss, Elton John, Stella McCartney and Sting. The outside of her shop echos the pretty delights on offer in her book. Recipes range from the most intricate creations on Earth (which I admit... give me the collie-wobbles) down to easy to master biscuits which can be made to look like a masterpiece with the right techniques. Peggy's step-by-step approach, and easy to follow instructions make even the most complicated methods achievable. I loved this book because it's well balanced; cupcakes, layer cakes, biscuits, meringues, tarts, cake pops and... bundts. You know I had to. 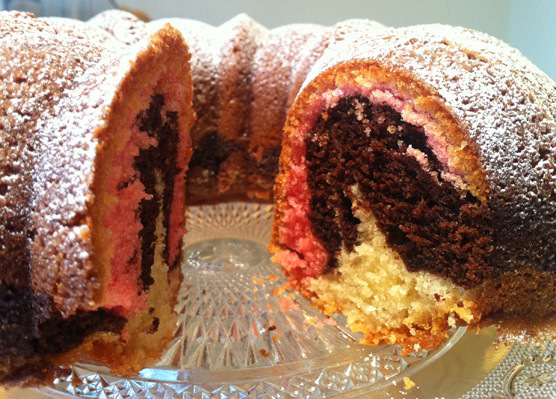 I decided to tackle the Neapolitan Marble Cake. Pretty as a picture! OCD kicked in... would I get the swirls to look like Peggy's without it all mixing together? 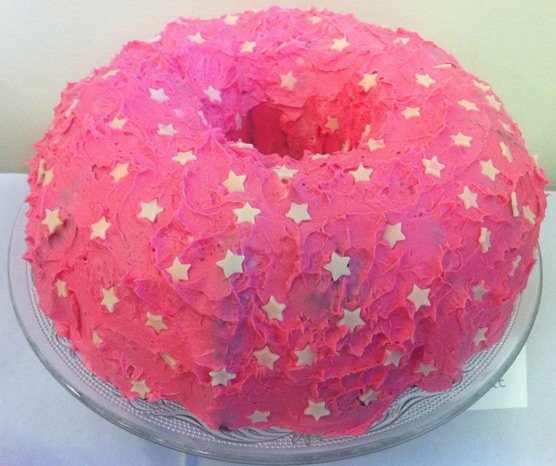 I know bundts. I know how they think. This was a really good recipe test as they are something I make regularly. It worked a ruddy dream. One of my favourite cakes ever. Ever ever. 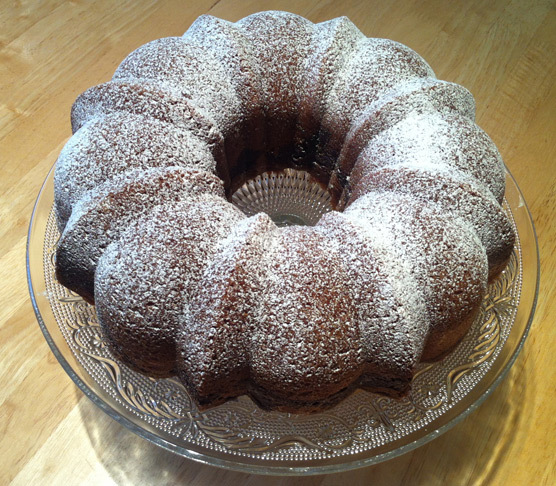 It came out of the tin just as easily as my firmer bundt type cakes, and the 'swirl' was as desired. Perfect. The cake was great too. Even my husband (totally NOT a cake face like me) loved it. Light as fairy fluff but still with that signature crisp bundt base. 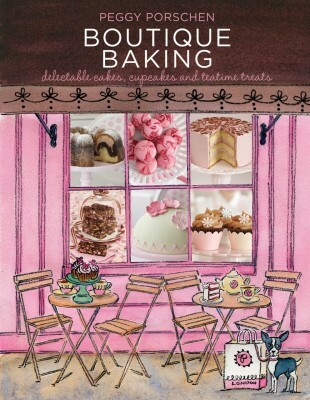 Disclaimer: I reviewed this book because this lady has a pink shop and produces the prettiest things I have ever seen. I received no payment from the publisher for doing so. Read more about the author at Quadrille. I don't have any children. I have a cat. I found myself totally out of touch with what is 'down with the kids'. Apparently, five year olds want scary monsters! My initial OCD led me down the 'arrrggghhhhh!' path, but this is the year of trying new things... so off I trot to the sweet shop. The only specialist bakery items I bought were the eyes, stars and polka dots. Everything else came from my favourite sweet shop in Bolton, Mr Simms. I walked in and announced, "I'm required to make monsters!'. 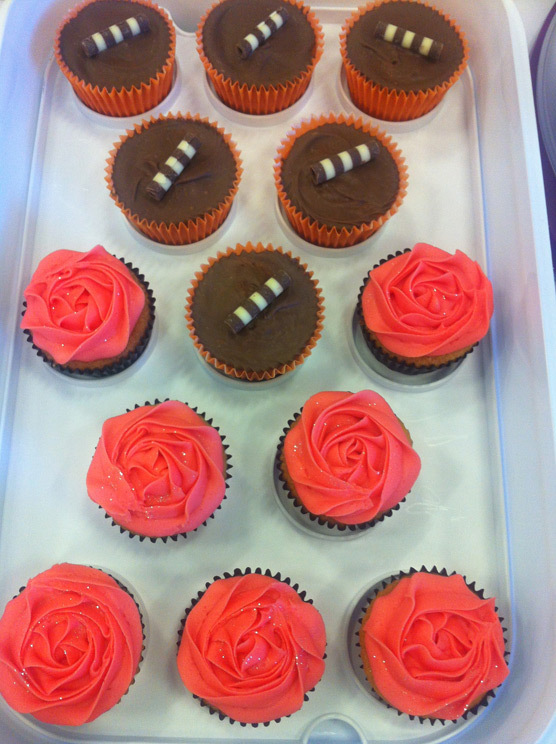 On Monday we held the second part to the Bolton Bulls fundraiser at work. 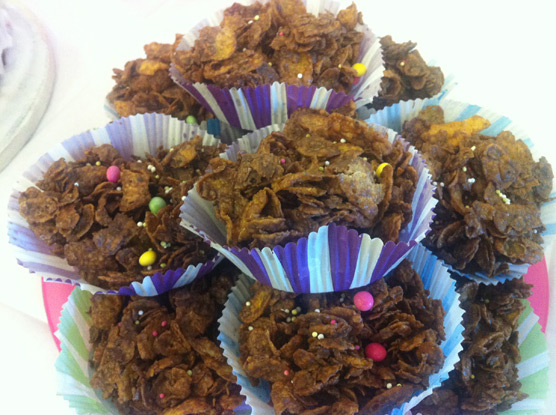 After the success of the Easter events, we were really keen to have a brilliant bake sale. I rallied the troops, and they didn't disappoint! If there's one thing I can say about my colleagues, it's that they have passion! Over the two days, we managed to raise £259.97 for the Bulls. Thanks to everyone who baked or bought goodies from our little stall! Here are some pictures of the items made! I've always been a huge admirer of Prue. I've watched her on every series of the Great British Menu and leafed through her cookery bibles in awe of what she has achieved. 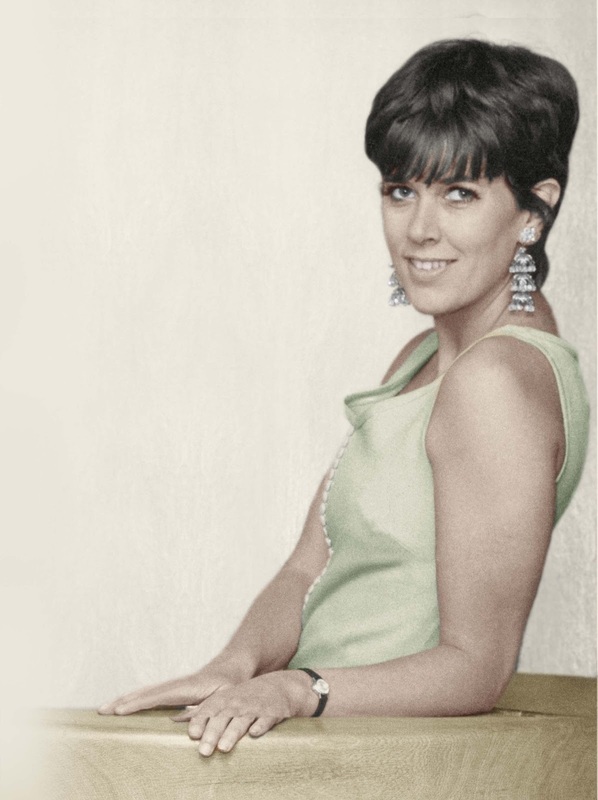 I was dying to read her autobiography, mainly because I'm a bit of a nosy parker and Iove to know what is going on behind closed doors. If you're looking for a fairytale filled with beautifully crafted cakes and a well roasted bird, you are in the wrong place. Ring Delia. 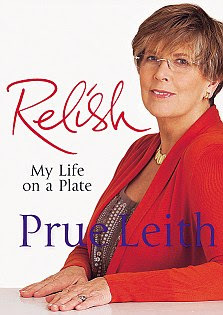 Prue does nothing to sell herself, but offers a totally candid account of her life. She was a confident child from a loving and privileged family. She grew up in South Africa with few boundaries; something which possibly assisted her in adulthood. She grew from a mischief maker to a risk taker, and never looked back. Prue's life experiences have made her the successful woman she is today. Whether you agree with her actions or not, it's really interesting to see how her adventures moulded her life. Clearly at ease in her own skin, it seems now was a perfect time to share her story with the world. This book is not for the faint hearted, but I get the sneaking suspicion that she intended to throw a cat amongst the pigeons with this one. In summary, Prue is painfully honest, not afraid to make mistakes (or admit to them) and for that reason she is a self made, successful woman. Disclaimer: I reviewed this book because I am a nosy parker (cheese & tomata...) I received no payment from the publisher for doing so. Read more about the authors at Quercus. 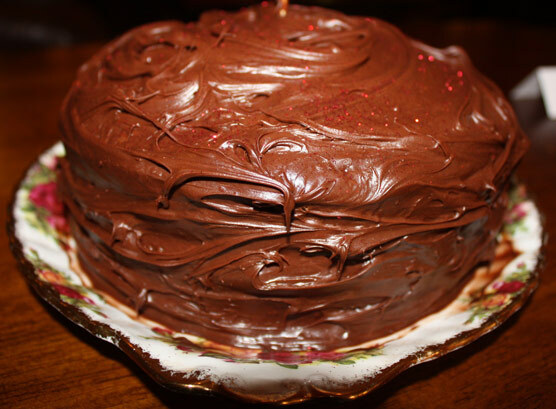 I love to use glitter on my cakes. It doesn't taste of anything, but gives cakes a certain 'boooooom!' that you don't get from frosting alone. It's glam, it's sparkly... it's causing a right ruckus! Last week I was chatting to @clandestinecake, @CCCPudsey, @domesticjules and @acedavesgirl about glittter on Twitter (really...) and the general hoo-hah in the press about whether it is safe to put on cakes. I really didn't take it too seriously. I use it all the time, and I don't glow in the dark or twitch, and I'm not dead. 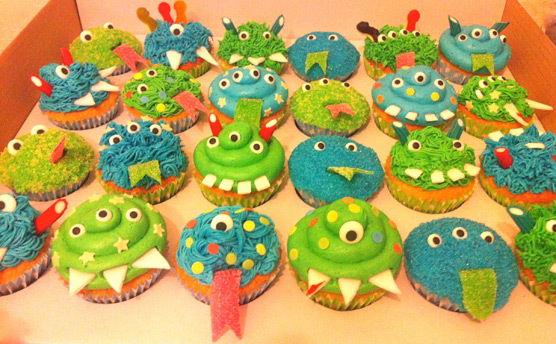 This week I am tasked with making some 'monster' cakes, so I set about buying some garish green glitter for the occasion. Off I trot to Hobbycraft with list in hand. Now, this is just my luck. I was informed by the 'baking expert' that all glitters had been removed from sale about ten minutes before I arrived, amid fears from head office that the packaging was misleading. When I got home I read the Food Standards Agency Guidance. Although this outlines that the 'non-toxic' glitter I have been using isn't to be consumed, it didn't say that it was harmful. It is recommended that these products be removed before consuming. This morning another article appeared in the Mail Online, which claims this debate was prompted by Sarah Hadland, after she joked with Paul Hollywood on the Great British Bake Off that she wasn't sure that the glitter going on top of her Red Velvet cakes was actually edible. Rather than give guidance, this appeared to confuse consumers even more. 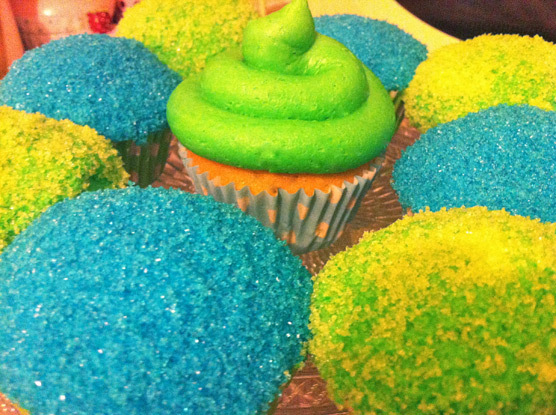 After being bombarded with questions, it was ruled that these glitters were not to be eaten. The upshot is this. Glitter is non-toxic, but it is not absorbed by the body. It just passes through (spare me the toilet comments...) Therefore, it is not a foodstuff. Only foodstuffs should be eaten. One eBay seller uses a compelling argument on his online 'guide'. He suggests that sweetcorn should carry the same 'non-toxic' label, as the husk is not absorbed by the body. I've been using these products for a while with no adverse effect. I use them in very small amounts and I'm not personally concerned about using them again. However, it's all about choice, and what I do support is clear labelling so that consumers are able to make an informed decision. There is of course an alternative to the 'non-toxic' variety of glitters, including mica with titanium dioxide (often found in make-up) and starch based products. I googled these products and came up with quite a few very quickly. 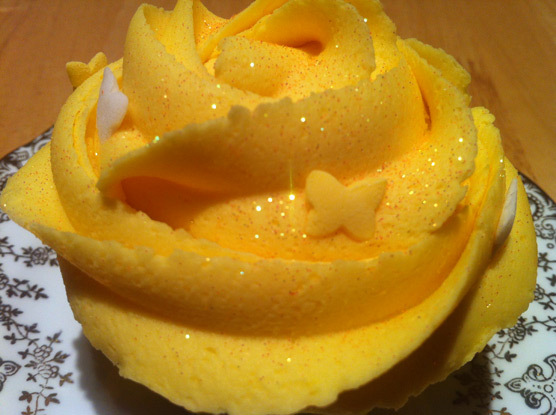 CCC Shop have a wide variety of colours in two different types of 100% edible glitter. A couple of months ago I was on a crazed mission to get a personalised apron made. 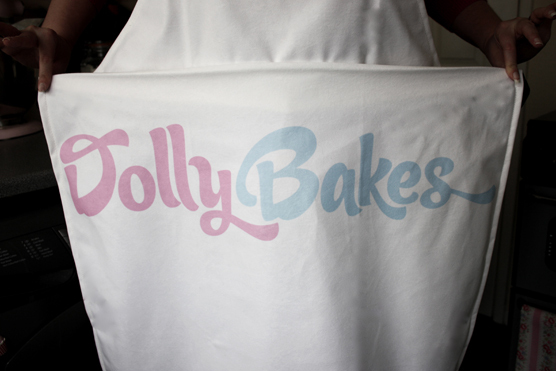 I wanted a plain white one with my DollyBakes logo across the front. With all the personalised gift companies out there, I was fairly confident that this wouldn't be a problem. After about two weeks I gave up, quite frankly because the general quality was rubbish, or you had to order about 5000. A couple of weeks ago a lady called Pina from Bags of Love contacted me asking if I would review one of her company's products. First thing I looked for... an apron. There it was, in all it's glory. What these folk can do with your jpegs is amazing! Rather than just offer the bog standard picture in the middle of the apron, they can do the whole apron as a picture or a montage. They kindly sent me an apron with my logo across the front. What they didn't know, is I am a 'super-picky-OCD-perfectionist type'. Their product is fantastic. Really thick yet soft material which is machine washable, and the logo is crisp (and not that naff iron on type). 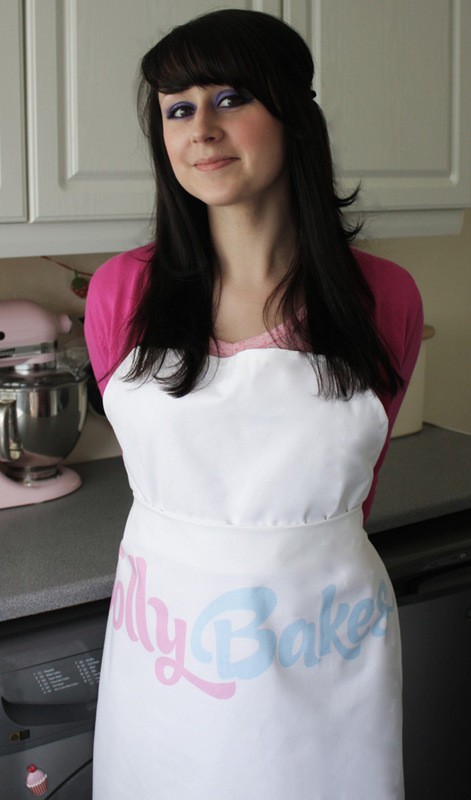 The aprons below start at £34.99 and take only 1 to 2 days to arrive. Visit their site, there are lots of original gift ideas; from the standard canvases and cards to more obscure items like deck-chairs and iPhone cases! They also have a really nice range of design anniversary gifts which go through the different materials associated with the year e.g. paper, cotton, leather, silk and wood. I'll definitely be using this company again. Fantastic product, friendly people and great gift ideas! Disclaimer: This is a sponsored post. Bags of Love contacted me via my website. They did not tell me which product I had to review, but gave me free reign. I reviewed this product not because I felt I had to, but because it's excellent quality and I genuinely love it! I always change recipes. Very rarely do I follow one to the letter. As long as you know enough about the chemistry of baking, changing ingredients or quantities is part of the fun. Over the last few weeks I have been doing a lot of thinking about new recipes, mainly for the Clandestine Cake Club and my blog. A conversation I had with a couple of the ladies at one of the clubs prompted me to ask the question, when is a recipe truly your own? I would have thought that most recipes start as something else, perhaps from a book, magazine or someone you know. 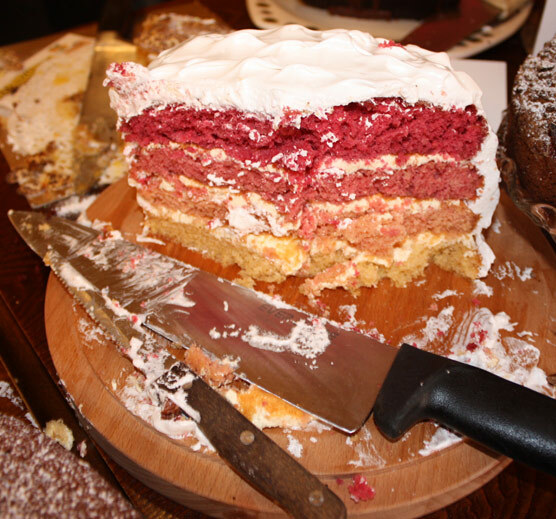 For example, over the last few meetings there have been a number of people who have made layer cakes based on the classic Victoria Sponge but added fruit, flavoured cream, colour or frosting. They have redesigned a traditional recipe and made it their own. However, they didn't actually create the base recipe from scratch. Does this matter? After all, it's widely recognised as the most reliable method? Does anyone start a recipe from scratch? Have you ever sat and thought, 'how much raising agent will I need for 200g of plain flour?' If you have, do you feel this is the only way a recipe can ever be 'yours'? The official publishing rules say that a recipe is yours if you created it without using another as a starting point. For it to be an amendment of someone else's, there have to be at least three changes; e.g. flavour, addition of fruit etc. This still isn't classed as original though, you will have to cite which recipe inspired it. Let me flip this one. If someone amended your recipe, would that be ok with you? Or would you want them to credit you with the original idea? If you've read my blog before, you will know that I do create my own recipes as well as trying other people's. The easiest way of doing this is to look at ratios and adopt a bit of trial and error! 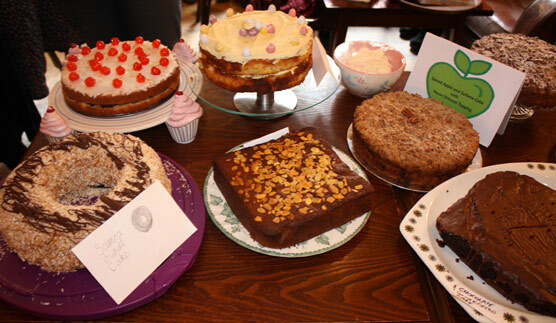 The Americans have a rich tradition of bake offs and other competitions where cakes must be original. Their methods probably make this a little easier, as cup measurements mean baking is done by volume rather than weight. My curiosity takes me to those who write the cookery books. Where do they start? Nigella often openly admits where she gets her recipes from, but it is rarely seen elsewhere. Are they all kitchen chemists? Years ago when I was in my 'muffin' phase, I bought a pink silicone muffin pan. They were everywhere, and I felt like I was missing out. However... 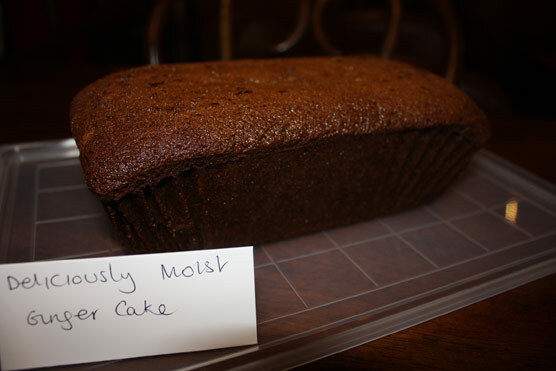 I was horrified to find that whilst the outside of the cake was cooked, the inside was a gooey mess. Raw. In a fit of rage I binned the wretched thing and vowed to avoid silicone at all costs. Now then. 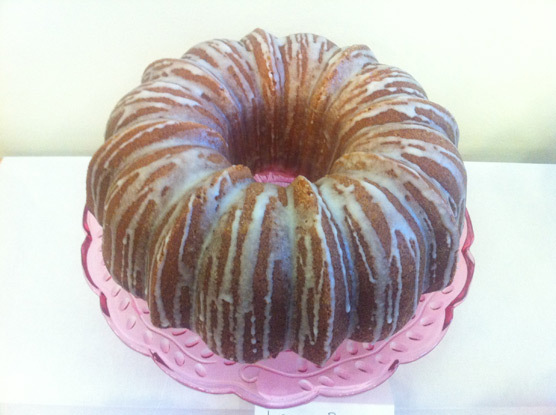 You might have noticed that recently I am very much in my 'bundt' phase. Proper bundt tins are expensive because they are very heavy gauge, and are often intricate in design. A couple of weeks ago a colleague mentioned she had seen carbon copies of these in Aldi, but they were made of silicone. After I had recovered from the baking disaster of 2009 flashbacks, and rubbished the moulds as imitations... I couldn't help but be curious. Could something that cost £3.49 really be as good as a tin that costs £30? I had to find out. Curiosity may have killed the cat, (although I am glad to say no cats were harmed in the making of this cake) but I was confident I would live to tell the tale. This is the tale. If you logged onto Twitter this afternoon, you will have seen me ranting about said bakeware. And plotting the bonfire I was planning to burn it on. I'm not in the business of bad reviews. Don't get me wrong, I don't think everything is perfect but I do believe in the mantra 'if you've got nothing nice to say, say nothing at all'. Silence speaks volumes. I can however be constructive in order to allow others to avoid disappointment (and fury). 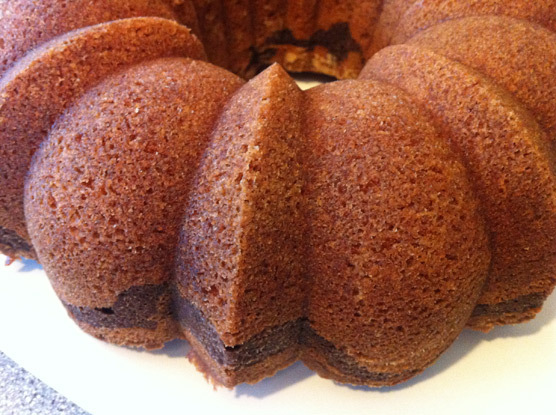 What I will say is that silicone will never (ever) replace my bundt tins. This cake was seriously flawed by the fact the bakeware did not conduct the heat sufficiently to create even baking. 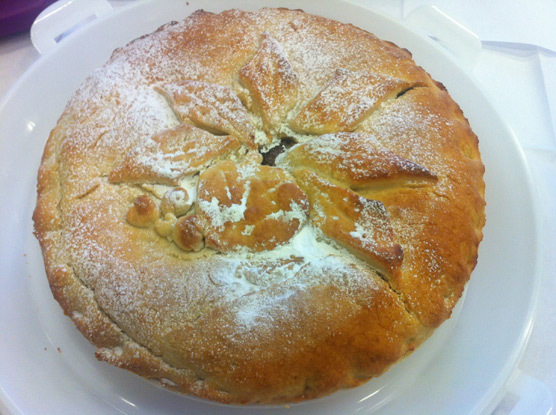 The edges and top baked quickly, leaving a liquid centre. I actually had to bake it for two hours. I know he recipe is robust, as I have used it before. Even after I removed it from the mould, it had to go back in to brown the top, as the centre was actually white. The texture of the inside was fine, but the outside was quite firm. The cake tasted great, but I'm not attributing that to the tin in any way! If you make this recipe, I recommend that you do not use silicone bakeware. Any heavy gauge tin will do. I would use a 10 inch ring or bundt pan. Grease and flour your desired tin. Cream the butter, vegetable fat and caster sugar until pale and fluffy. Add the eggs one at a time, beating on a slow speed until well incorporated. Mix the lemonade and the extracts in a jug. Sift in 1/3 of the flour then add 1/3 of the liquid. Repeat this until everything is combined. Again, don't overmix, just combine the ingredients. Pour the mixture into the tin. It will fill to the brim, but don't worry, it doesn't rise much because no raising agent was added. Just air! Bake in the middle of the oven for an hour and 30 mins or until a skewer comes out clean. Leave to cool in the tin, then turn out onto a plate. 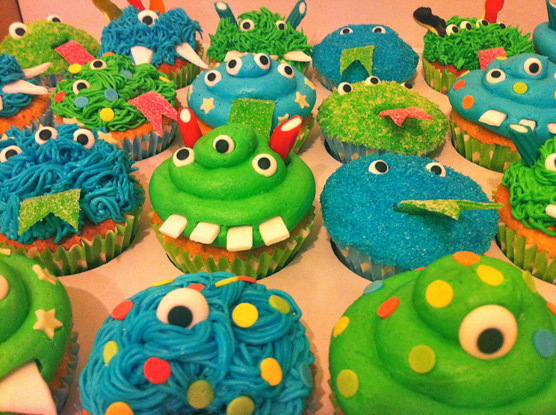 Either dredge with icing sugar (and in my case, glitter) or decorate using coloured icing. 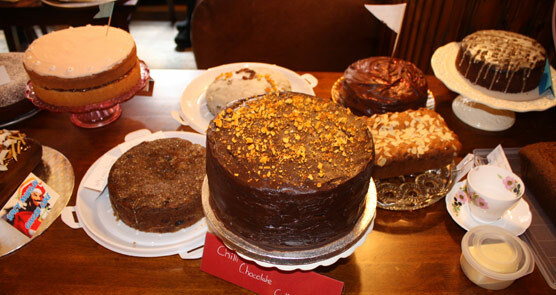 Today was the second meeting of the Clandestine Cake Club Bolton. A lot has happened since our first meeting in February! 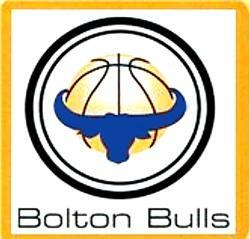 We needed a bigger venue, there has been huge press coverage, we recruited a boy (a real one) and two members of the Bolton Club have given birth! The club welcomes its newest recruits April Williams and Samuel Foster! 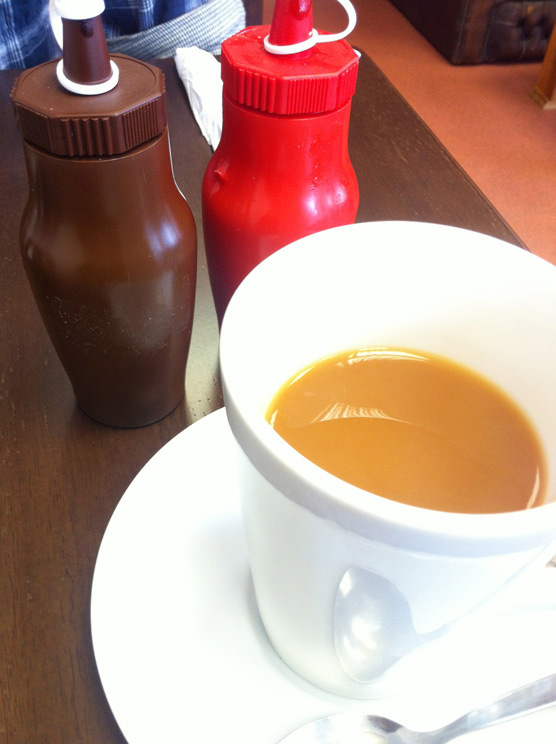 We had our meeting at Harvey's Cafe Bar in the centre of Bolton. I knew this meeting would be a big one, so it was ideal. Dominic, the general manager was extremely accommodating (despite us creating ten tonnes of crumbs...) and the staff catered for our every need. They even managed to produce a pile of kitchen knives any serial killer would be proud of... Lots of people who were already in the venue came asking questions, and one has already signed up to the next event. After explaining how the cake club works to the new attendees, there was what can only be described as a polite stampede towards the table! 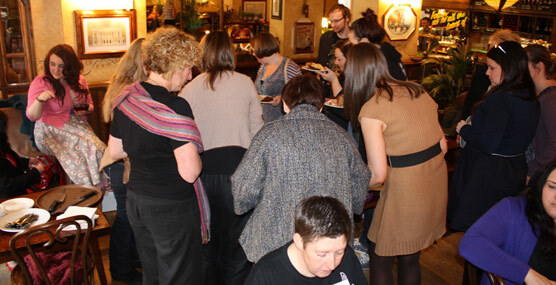 Thank you to Harvey's for accommodating a rabble of crumb-creating bakers and of course to everyone who came! The next event is on the 19th May at 3.30pm and the theme is the Great Village Show. It's limited to 25 places due to the size of the venue so please book early to avoid disappointment. Last week, Stephanie from Cherry's in Westhoughton offered to supply me with a prize for the Bolton Bulls fundraiser I was running. We had only ever chatted on Twitter, so I was really grateful! I went over the Easter weekend to give my thanks in person, and to sample some of their goodies! 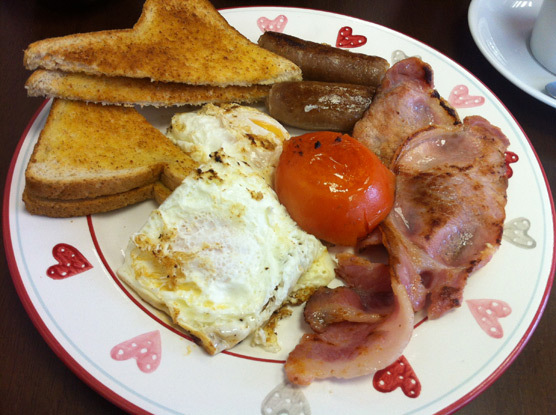 It was raining cats and dogs, so we both plumped for a full english, followed by a massive wedge of lemon drizzle cake with cream. The breakfast hit the spot, and that cake was out of this world! Really soft, yet zesty. 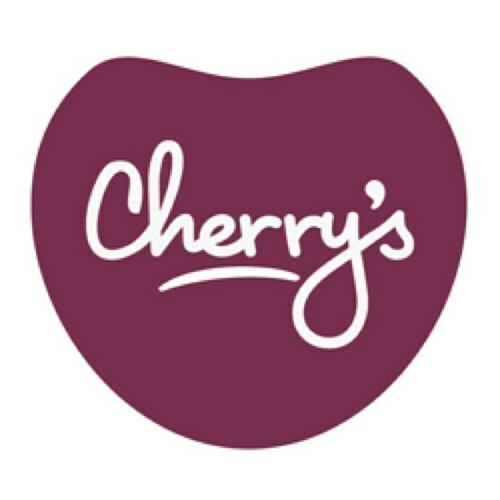 Cherry's is a traditional cafe with beautiful home made cakes, which change each day. They have only been open eight weeks, but I have no doubt this place has the potential to become a really popular little haunt. The owners are such lovely people, I urge you to go in for some homely food and a chat. Follow Cherry's on Twitter here for regular updates. I'm not much of a coffee drinker. I love a good, strong cup of tea. No sugar, just a little milk. What goes well with a nice brew? You got it cake fans. A slab of something sweet. 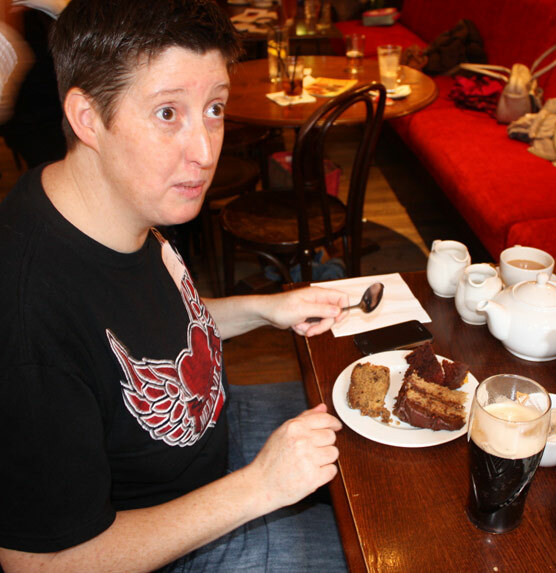 Since going to T & Cake in February, I've been frequenting tea rooms at every given opportunity. 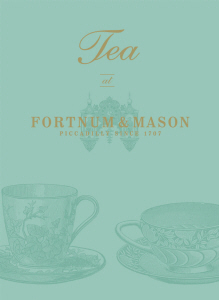 When it comes to tea, Fortnum and Mason know their stuff. For three centuries, they have sourced the best teas from across the globe. This book will teach you all about tea and its colourful history, but also gives recipes for sweet and savoury goodies that are the perfect match. The book starts with a little history... I was supposed to be looking at recipes, but instead found myself absolutely fascinated with the origins of the company, the original advertising and the history of the shop. The business was set up in 1707 by a livery stables owner and a royal footman, and was originally a grocers and tea merchant. Tea was an expensive luxury item due to the time and expense it took to ship the goods to England. However, by 1707, the demand for tea had meant there was a thriving black market meaning tea was mixed with all sorts of nasties. You could say that it was the common drug of the day! Those who visited Fortnum & Mason were guaranteed a pure (and legal) brew. So I decided to make something that would complement my Easter baking. 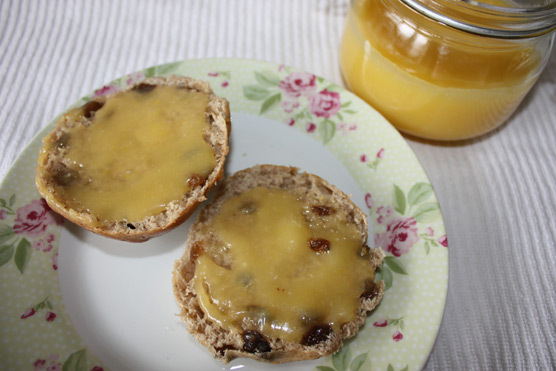 I had made Hot Cross Buns on Easter Saturday so decided on lemon curd. I've never made curd before, so it also fit in well with this year's challenge to make new things. 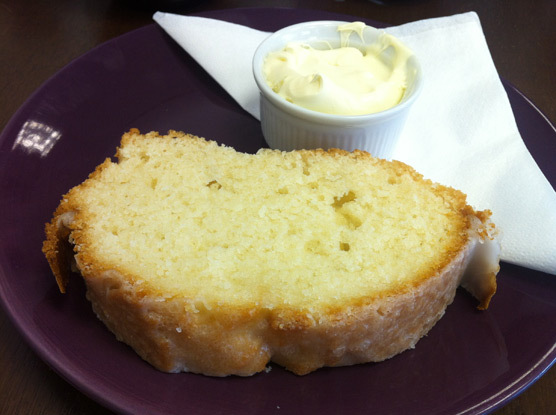 I've had a bit of a bee in my bonnet about lemon curd since our February Bolton Clandestine Cake Club. One of the ladies made a ginger cake which was accompanied by a tub of home made curd. I convinced myself it must be terribly difficult to make. 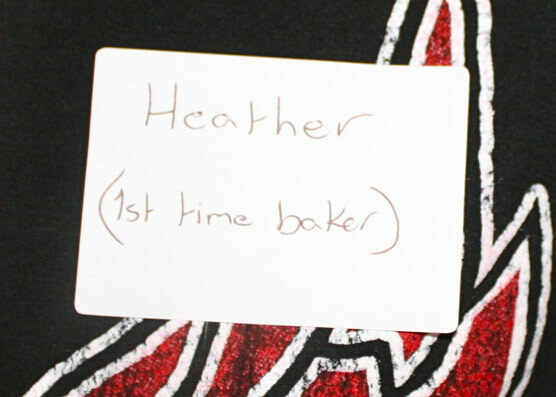 I had a chat with Susan from A Little Bit of Heaven on a Plate at the last South Lancashire Clandestine Cake Club. She reassured me that it was quite simple, and managed to calm my OCD. Again. This little book is any tea lover's pocket compendium. 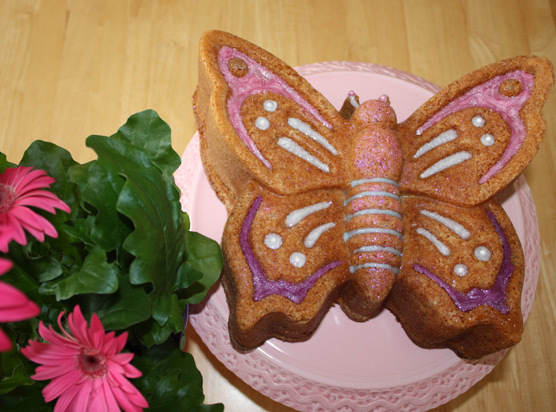 Perfect for anyone planning a tea party over the spring or summer months. Disclaimer: I reviewed this book because I like a brew with a piece of cake. I received no payment from the publisher for doing so. Read more about the authors at Ebury Press. The bulbs are coming up, birds are tweeting, and the cat is going absolutely mental. So, despite the weather thinking it's swinging between Summer and Winter, it's spring. Add the eggs one at a time, beating well after each addition. You'll see the mix get noticeably fluffier. Pour the yoghurt and the extracts into the creamed ingredients and mix well. Sift in the flour in two halves. Mix this slowly until all the flour has disappeared. Over-mixing at this stage will make a dense cake and may cause air channels. This can ruin the shape of a decorative bundt. Leave the cake to cool fully before removing from the tin. 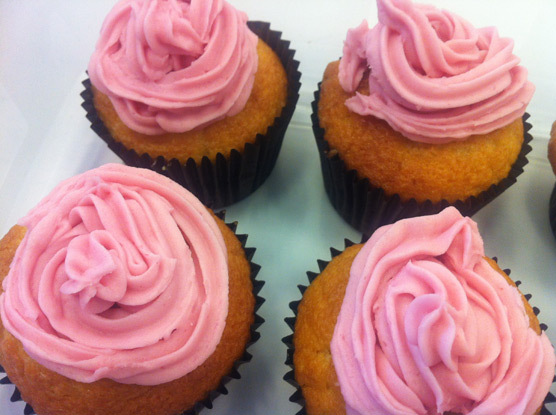 Serve either plain, dusted with icing sugar, or camp as you like with glitter and icing to pick up the shape of the tin. This cake can easily be modified to suit your tastes. Just replace the yoghurt with a different flavour and omit the strawberry essence with something else. Zests make a nice addition too. 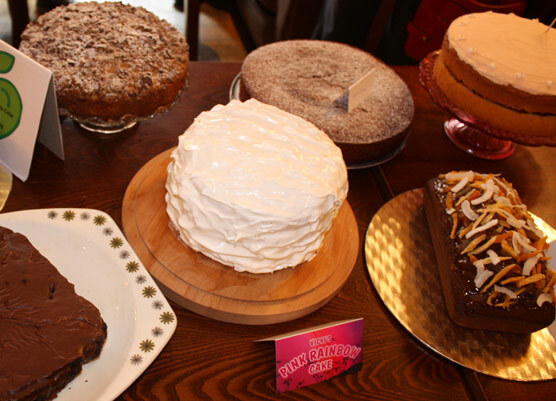 If you would like to join any of the Clandestine Cake Clubs, please visit click here. The next Bolton Club is on 14th April, with the May one being announced shortly. I have never made hot cross buns before. It always seemed like a bit of a faff. However, I felt incomplete without them in my repertoire. My next problem was which recipe? The internet has been awash with them over the past week. Everyone has their special recipe; a flavour twist, a bun that's not a bun, one massive bun and whatnot. 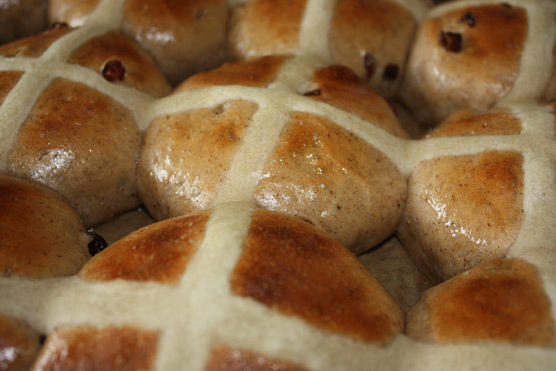 I decided, for the first time in my life, that I wanted a traditional hot cross bun because that's what I like. My only exceptions being a lack of candied peel (evil) and more cinnamon (heavenly). Now then. In the back of my mind I was already considering the things that could go wrong. My OCD made me put a plan in place for each eventuality, and it seemed to work! Solution? Add more cinnamon. Simple. Solution? Give them more space than the original recipe specifies. Solution? Have word with self beforehand and make a mental note to get a grip. I decided to use a Fabulous Baker Brothers recipe I found in last month's Delicious Magazine as my guide; mainly because they looked appealing and there was no fancy faffery going on. I could change the recipe to suit my tastes quite easily. This recipe is amended slightly from the original. Add the flour, yeast, spices, salt, sugar, butter, milk water and egg into a large bowl and bring together with a wooden spoon or by hand. If it's looking a tad dry add a little more water. It will look a bit sticky, but this is rectified by kneading. On a floured surface, push in the zest, fruit and ginger. I did this the same way you make puff pastry - add a layer of filling then fold it over. Add more then fold again etc. When it has doubled in size put the dough on a floured surface and cut in half. Repeat this process with each section of dough until you have 16 buns. For those of you as OCD as me, each one was about 90g. 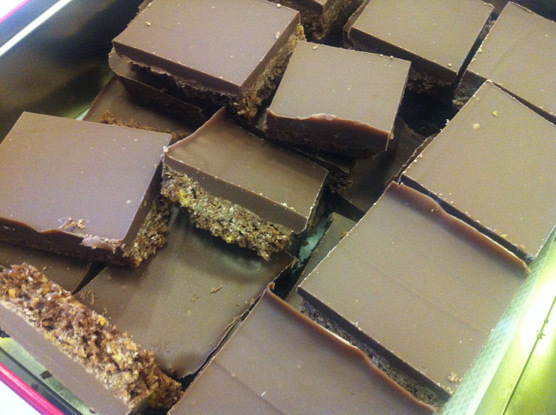 Place these on a large baking tray about half an inch apart. Use two trays if you have to. Cover the buns with lightly oiled cling film, and leave to prove again for about an hour. Again, I popped them in the grill section with the main oven on. Make the crosses by adding the flour, salt and caster sugar to a bowl. Slowly add the water and melted butter. Beat it with a whisk until smooth - this takes about a minute. 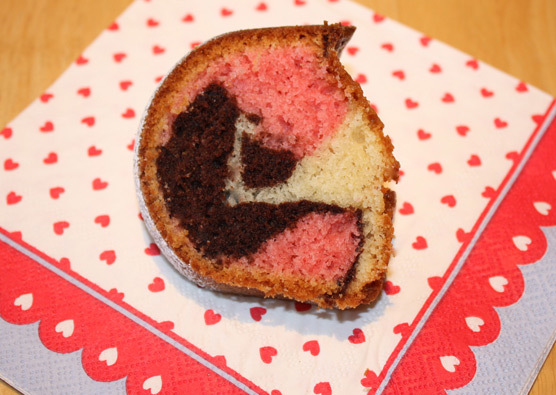 Pop the mixture into a piping bag (no need for a nozzle) with a hole about half a centimeter wide. When the dough balls have doubled in size, you'll find that they are touching each other slightly. Pop in the oven for 15 minutes on gas 6.5/210 c.
When they have about five minutes to go, make the glaze. Put the boiling water, sugar and cinnamon in a small pan and boil for 30 seconds. That's it. When you bring the buns out, paint them with the glaze using a pastry brush. It won't make them soggy, just beautifully shiny. These buns take a long time to make, but are well worth it. I served mine warm with home made lemon curd.